Formerly known as: The "Esquimaux" 1897 to 1910, the "Elks" in 1922. The Edmonton Eskimos Football Club is one of three "community owned" teams in the CFL (owned by local shareholders). This was once the most common type of ownership in the CFL. In 2006 the Ottawa Sun reported that shares cost $10 each, but were not open to the general public and required the approval of the 80 existing shareholders. This contrasts with the Saskatchewan Roughriders, one of the other community owned teams in the CFL, who have offered shares to the public (much in the same way as the NFL's Green Bay Packers do). The Winnipeg Blue Bombers, the other community owned team, operates as a corporation without share capital. Edmonton Eskimos, Inc., is governed by a ten-member board of directors. The board consists of a chairman, treasurer, secretary, and seven directors. As of 2017[update] the board of directors included chairman Brad Sparrow, treasurer Janice Agrios, secretary Murray Scambler, directors Douglas Cox, Rob Heron, Ian Murray, Harold Roozen, Marshall Sadd, Lindsay Dodd and Tom Richards. The club's president and CEO is Len Rhodes, he is not currently a member of the board. The story of team's name goes back to stories in the press from at least 1903 and possibly as far back as 1892, the first date of a "rugby football" game between Edmonton and Calgary. It is a legacy of the bitter rivalry between the cities of Edmonton and Calgary, the so-called Battle of Alberta. In the early years of sports competition between the cities, the press in each town used colourful nicknames to insult the rival team's home. Edmontonian writers called Calgary "the cow camp", "horse country", or "the little village beside the Bow". Likewise Calgary's responded with insults about Edmonton's northern latitude and frigid weather, calling the city's residents "Esquimaux" (an archaic spelling of "Eskimos", referring to the indigenous people of the Canadian Arctic, properly called Inuit). Despite the fact Edmonton is several thousand kilometres south of the Arctic, the name "had the advantages of alliteration, neatness, uniqueness, and a certain amount of truth," and thus, according to historian of Edmonton Tony Cashman, "it stuck." The name remained an unofficial nickname, however, until the arrival in Edmonton of American baseball coach and sports promoter William Deacon White in 1907. White founded the Edmonton Eskimos baseball team in 1909, the football Eskimos in 1910, and Edmonton Eskimos hockey team in 1911. Of the three, only the football teams' name has survived. In part because they do not use any native imagery, the Eskimos are rarely mentioned with regard to the Native American mascot controversy. A notable Inuk who openly supported the team name was Kiviaq, also known as Dave Ward, who was briefly a member of the team but was injured before playing in a regular-season game. However Natan Obed, the President of Inuit Tapiriit Kanatami, Canada's national Inuit organization, has stated that "Eskimo is not only outdated, it is now largely considered a derogatory term" and is a "relic of colonial power". Former Eskimos player Andre Talbot stated: "Sports organizations need to be community building organizations. And if we're isolating and offending part of that community, then our particular organization or league is not doing its job." After Inuit singer Tanya Tagaq suggested that a name change would show respect, Paula Simons of the Edmonton Journal wrote an editorial pointing out that "Eskimo is a name that never properly belonged to Edmonton at all, a borrowed, appropriated name that disrespects not just the Inuit people, but also the other First Nations who actually did call this territory home". However, in 2017 CBC News reported that other Inuit had no objection to the use of Eskimos in the team's name. The editorial board of the Toronto Star sees a name change as the inevitable result of social evolution. The Eskimos made it to nine Grey Cups in a ten-year span from 1973 to 1982 (the only year they missed the Grey Cup during that time was in 1976). Since Edmonton re-entered the CFL in 1949, only one other team—also Edmonton—has won even three championships in a row (1954–56). The achievements during the Eskimos dynasty were documented in the book, Decade of Excellence, with photographs by Bob Peterson. As of August 2016, the Eskimos also have had the largest average attendance in the league 27 times since moving to Commonwealth Stadium in 1978. The current uniform colours, green and gold, were adopted when the Eskimos received uniforms from the University of Alberta Golden Bears football team, which was dormant due to a lack of competition at the time the Eskimos began play (in their current incarnation) in 1949. The colours have remained since that time, and the Golden Bears maintain them to this day as well. The Eskimos had their jerseys remodelled for the 2012 season and brought back the green helmets that were worn for the Labour Day game and rematch in 2008, and also the 'five-stripe' pattern with the Eskimos' monogram (albeit with the current one in use since 1996) on the sleeve stripes which was used from 1980-95. The green helmets were worn with the away jerseys and marked the first time in franchise history that a helmet other than gold was worn as a regular facet of the uniform. It was also the first time in franchise history that two different helmets were worn for home and away uniforms. The team also stopped alternating pant and jersey combinations during this season, using consistent home and away looks all year long. 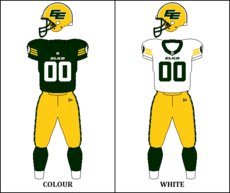 However, during the following season, on August 24, 2013, the Eskimos returned to the all-green combination of green helmets, jerseys, and pants that had not been worn since 2008. The Eskimos first wore their gold helmets with their away uniforms for a regular season game on October 19, 2014 and wore them again in the post-season on November 23, 2014 with matching gold pants. Gold helmets were worn with away uniforms in three of eight regular season games in 2015. In 2014, the team introduced their Signature series alternate uniforms, which was the second alternate uniform to be worn in team history (not including throwback jerseys). With the league switching uniform contracts to Adidas in 2016, the Eskimos again redesigned their uniforms, with the jerseys more closely resembling the simplistic jersey stripe pattern worn from 1996 to 2011. The white jerseys removed the green side-panelling and the team retired the green helmet. The team also removed shoulder numbers (which are known as TV numbers), which was the first time the team did not have numbers on the shoulder since 1965. For this season, the team wore gold pants for every game played, including with their Signature series alternate uniforms, which were retained following the Adidas redesign. Nanook (a polar bear) and Punter (an anthropomorphic football) are the mascots for the Edmonton Eskimos. They were introduced in 1997 and 2004, respectively. ^ "Edmonton Eskimos Club Profile & History" (PDF). 2017 CFL Guide & Record Book. Canadian Football League. Retrieved December 1, 2017. ^ "About Us". Esks.com. CFL Enterprises LP. Retrieved June 8, 2018. ^ Hall, Vicki (October 15, 2006). "Eskimos left out in cold". Edmonton Journal. Archived from the original on 2015-11-23. Retrieved May 12, 2014. ^ CFL.ca Staff (November 11, 2010). "By the Numbers: Playoffs???!!!". Canadian Football League. Archived from the original on October 29, 2013. Retrieved May 12, 2014. ^ Seskus, Tony (2007-09-01). "Community ownership a port in CFL's storms". Calgary Herald. Archived from the original on 2014-05-13. Retrieved 2014-05-12. ^ Canoe inc. "Local ownership 'fraught with uncertainty'". canoe.ca. Retrieved 9 December 2014. ^ "Board of Directors – Edmonton Eskimos". Edmonton Eskimos. Archived from the original on 3 December 2014. Retrieved 9 December 2014. ^ "Eskimos". Edmonton Eskimos. Archived from the original on 2014-12-13. Retrieved 9 December 2014. ^ "Profile: Len Rhodes – Edmonton Eskimos". Edmonton Eskimos. Archived from the original on 13 December 2014. Retrieved 9 December 2014. ^ Kwong, Matt (June 20, 2014). "Washington Redskins fight could put pressure on Edmonton Inuit". CBC. ^ Obed, Natan (November 27, 2015). "Attention Edmonton Eskimos: Inuit are not mascots". The Globe and Mail. ^ "Former Eskimo who took Grey Cup to Nunavut thinks name change a good gesture". News Kamloops. November 29, 2015. ^ "Time to hear Tanya Tagaq's Eskimos challenge". Edmonton Journal. August 11, 2017. Retrieved 13 August 2017. ^ Barton, Katherine. "We have far more pressing issues,' says Inuk who backs Edmonton Eskimos name". CBC. We as the real Eskimos, want the name to remain!!. ^ Star Editorial Board (November 26, 2017). "Edmonton's Eskimos should get with the times and change their name". Toronto Star. Retrieved November 27, 2017. ^ Jones, Terry (2016-08-24). "Eskimos are still league leaders in attendance numbers, but half the seats at Commonwealth are empty". Edmonton Sun. Retrieved 2017-03-29. ^ "Mascots - Edmonton Eskimos". Retrieved September 25, 2017.